Even though I’m a fairly organized person, I have a really hard time keeping our refrigerator organized. 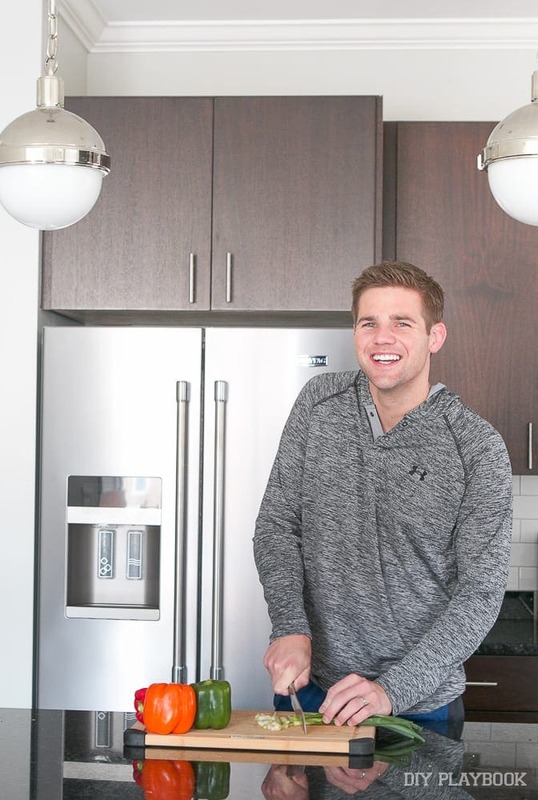 In fact, my husband always prefers to unload the groceries because I usually just throw items in willy-nilly and I certainly don’t utilize all of the valuable space inside the fridge. 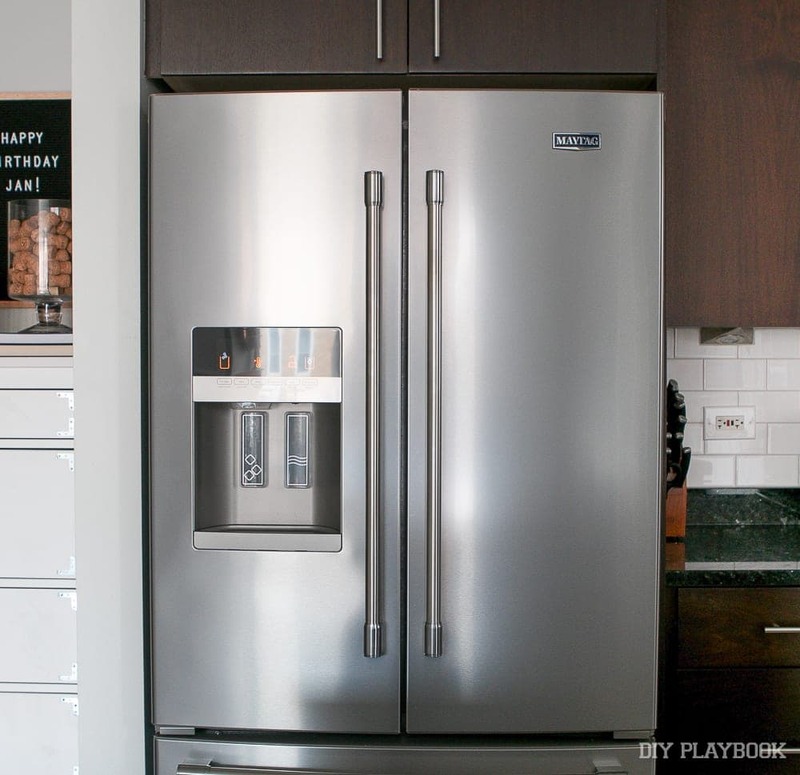 Our new refrigerator from Maytag was a new (exciting!) challenge for him as he now had to figure out how to efficiently use a fridge with French doors. 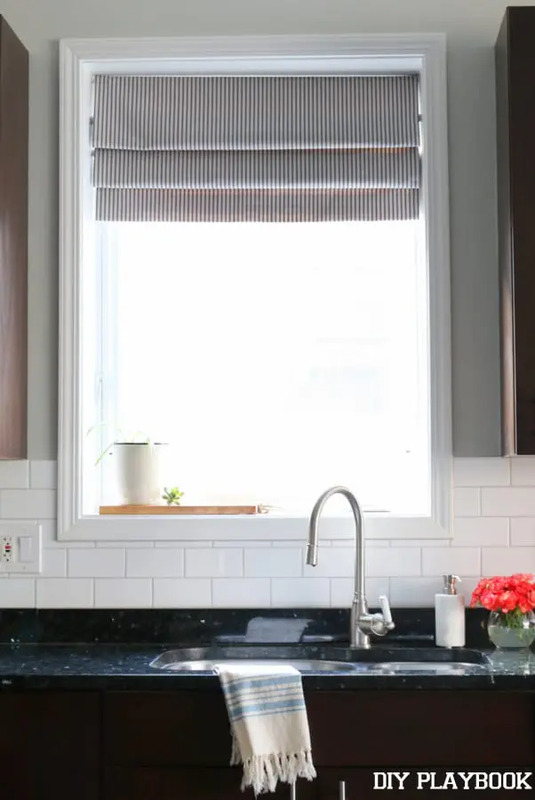 Since we’ve lived with the new fridge for a few months now, I figured it was time to share what we’ve learned when it comes to organizing a French door refrigerator. 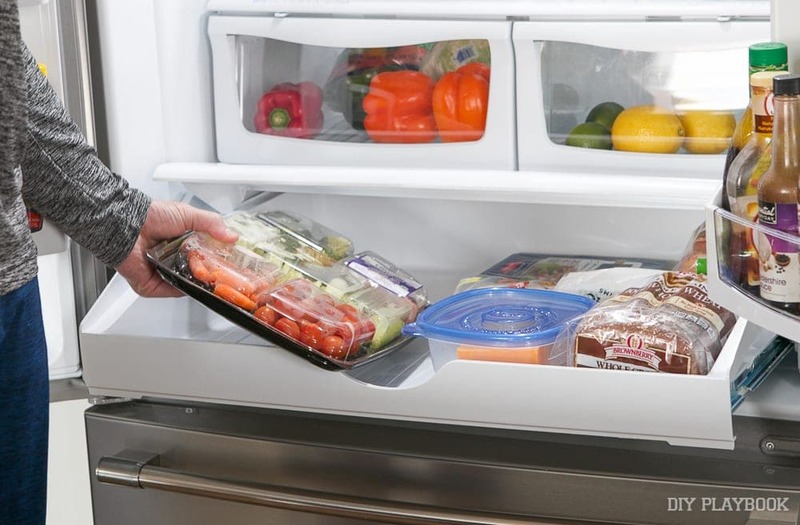 Here’s how to maximize the space in your fridge, while keeping your groceries fresh for as long as possible. The doors are the warmest part of the fridge, so you want to make sure that you don’t put anything there that simply can’t get warm (I’m looking at you milk!). 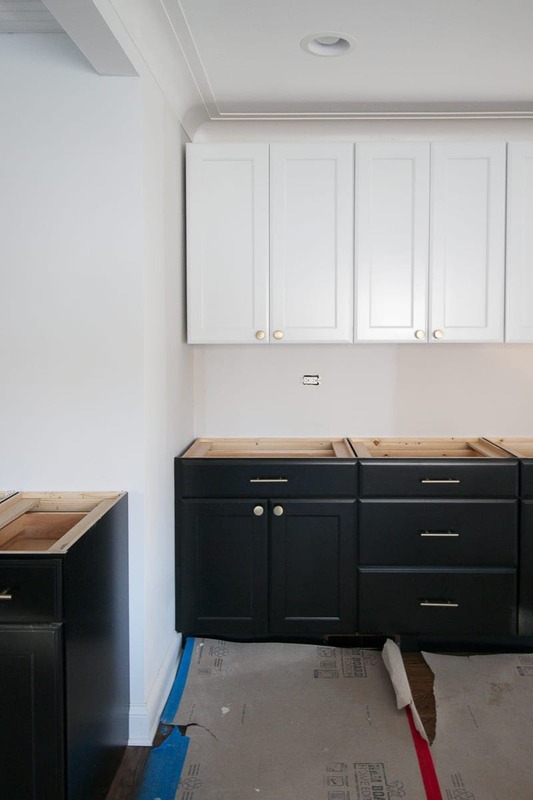 Instead, this is the ideal spot for condiments. 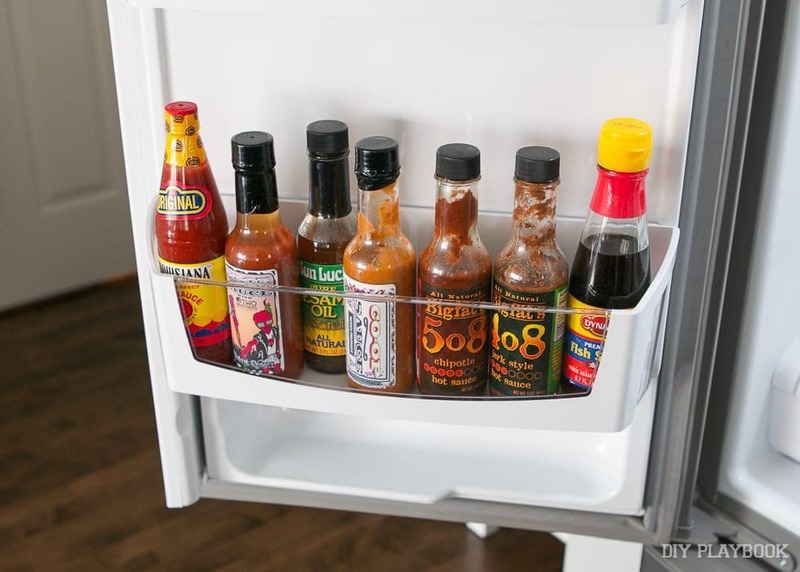 Since condiments have preservatives, they’ll stay just fine in this part of your fridge. We like to put our leftovers right out in the open where we can see them. That makes it way more likely for us to eat them. The worst thing is having delicious leftovers that you put in the back of the fridge and forget to eat. Instead, we like our leftovers right at the top of our fridge. Another tip? 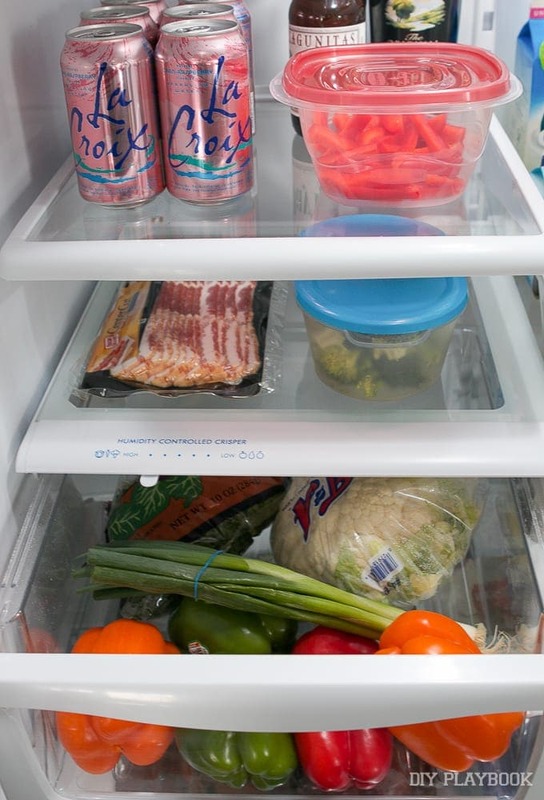 Make your fridge layout work for you. 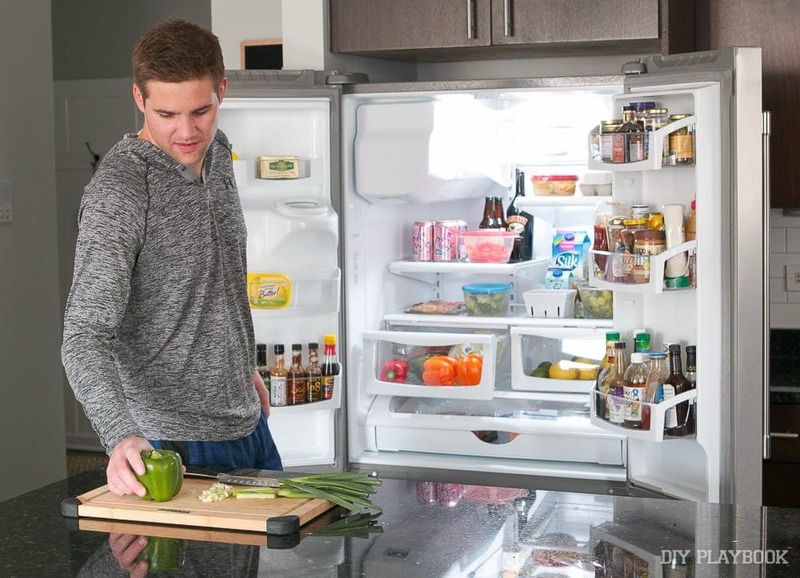 Don’t be afraid to adjust the height of the shelves so you can make the fridge work for you and your family. Taking a little bit of time now to get this all set will save you lots of time later on. 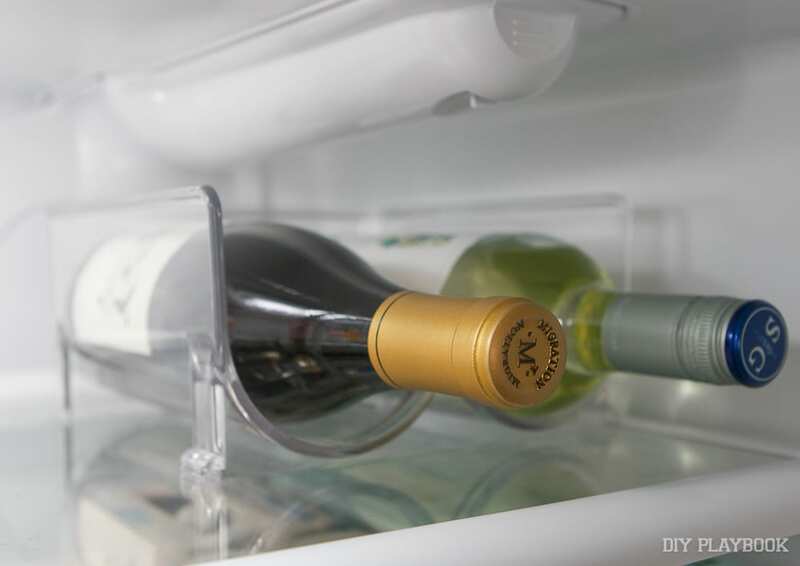 We recently purchased this inexpensive wine bottle holder and it has been a great addition to our fridge. 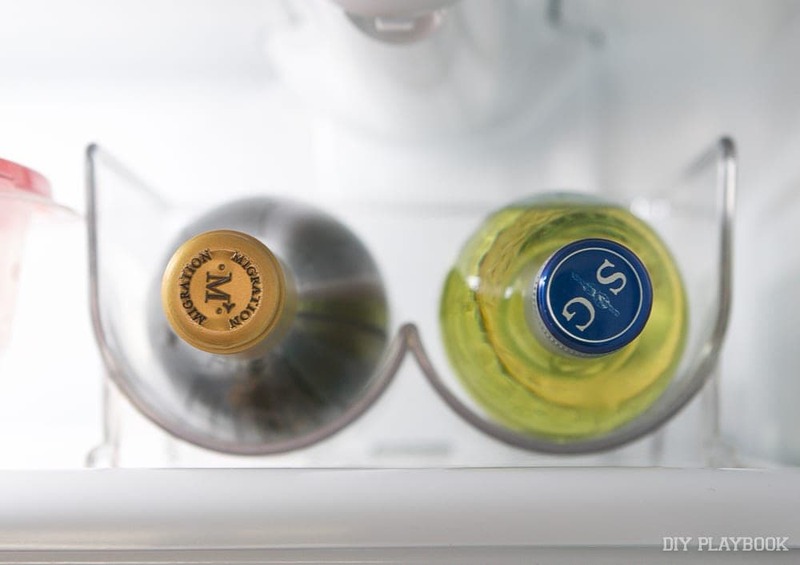 We used to always have wine bottles taking up space on the drink level, but now we can lay these flat on a shorter shelf. 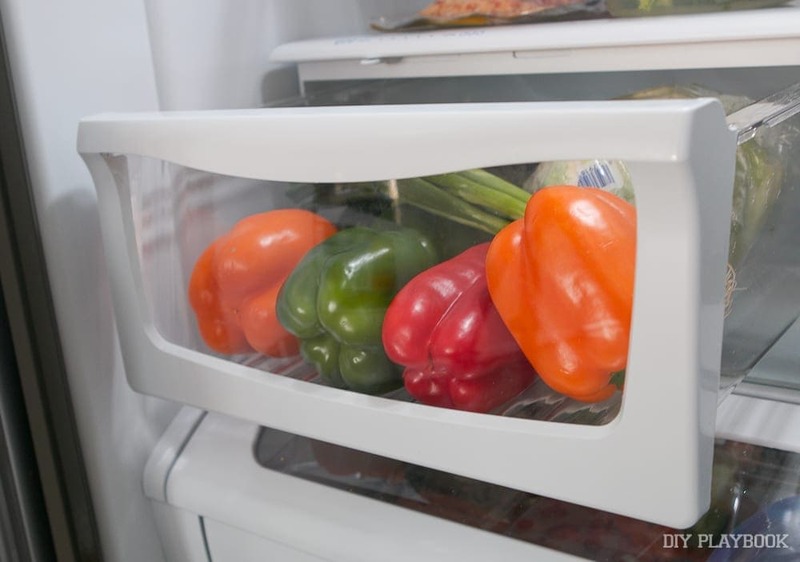 I suggest looking into a few budget-friendly fridge organizers to take your refrigerator to the next level! 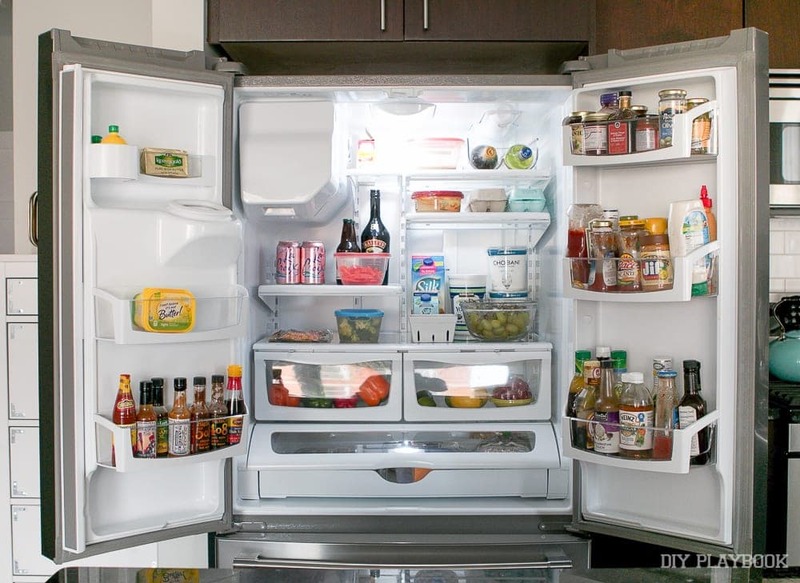 The wide deli drawer is BY FAR our favorite part of our new Maytag refrigerator. The pull-out tray at the bottom is amazing. It’s sooooo deep and you can fit so much in there. I’ll admit on the weekends this area usually holds a pizza box, but it’s also a great space for veggie trays or party platters. We also keep all of our cheese and deli meat in this compartment too. Dairy items should be kept in the very back where the fridge is the coldest. 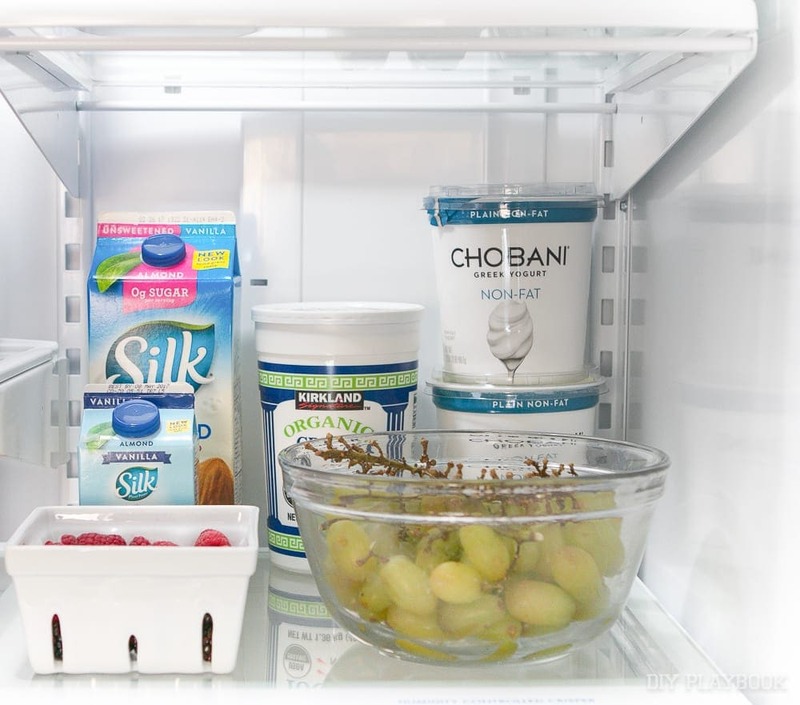 We’ll put our almond milk and yogurt in the back of the fridge so it stays fresh as long as possible. 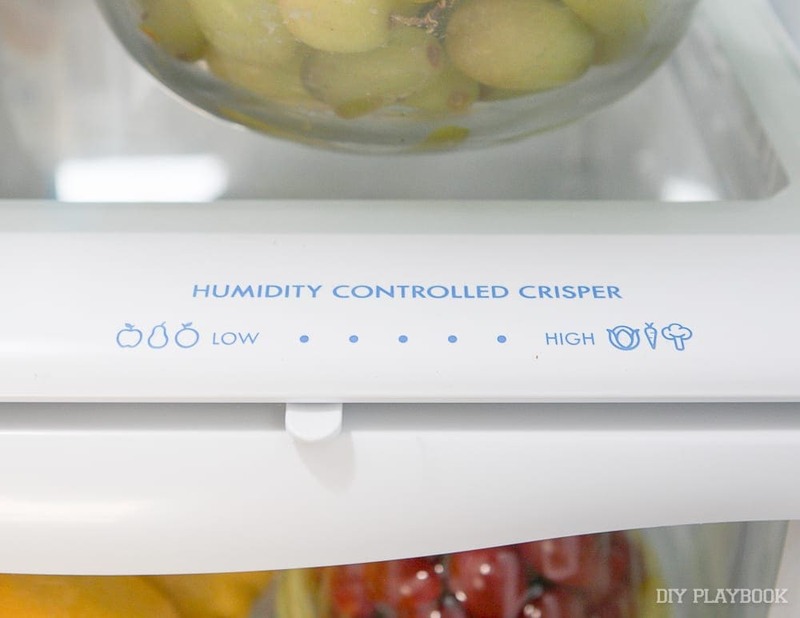 The humidity is regulated in the fruit and veggies drawers to keep your produce tasting great. We used to just throw all of our produce in 1 drawer, but utilizing these separate spaces has made a big difference for us. We’ll put fruit in the low humidity side, and vegetables in the high humidity side. The best way to get yourself to snack on fruits & veggies is to have it handy! Immediately when we get home from the grocery store, we will wash and chop everything. Celery, broccoli, and peppers will be cut so they can easily be hummus dippers. 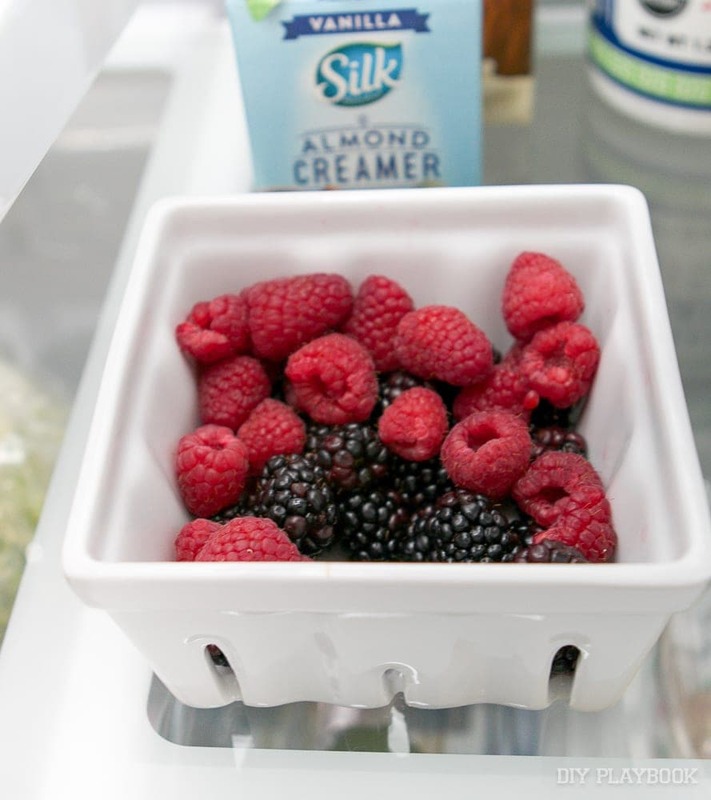 Berries will be rinsed and added to this cute little colander so they’re quickly added to yogurt and cereal. And grapes are washed and put in a bowl for convenient snacking! 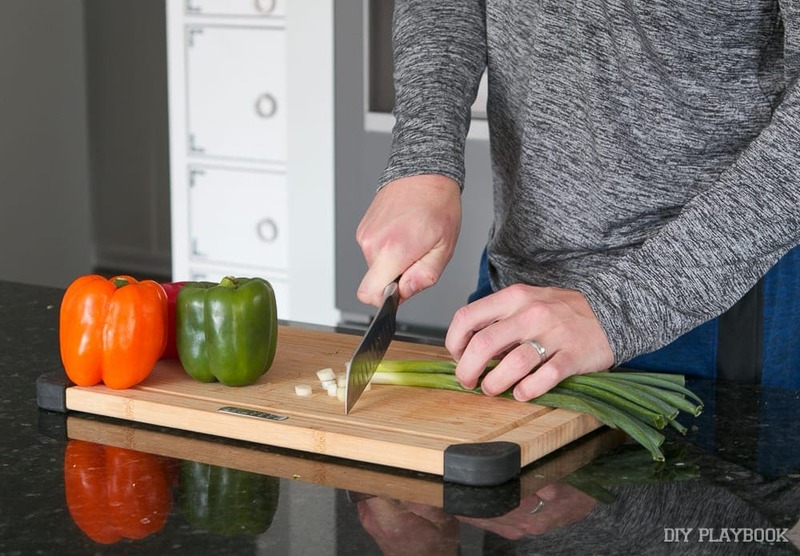 Doing this task right away will help you make more nutritious choices when your hunger kicks in. 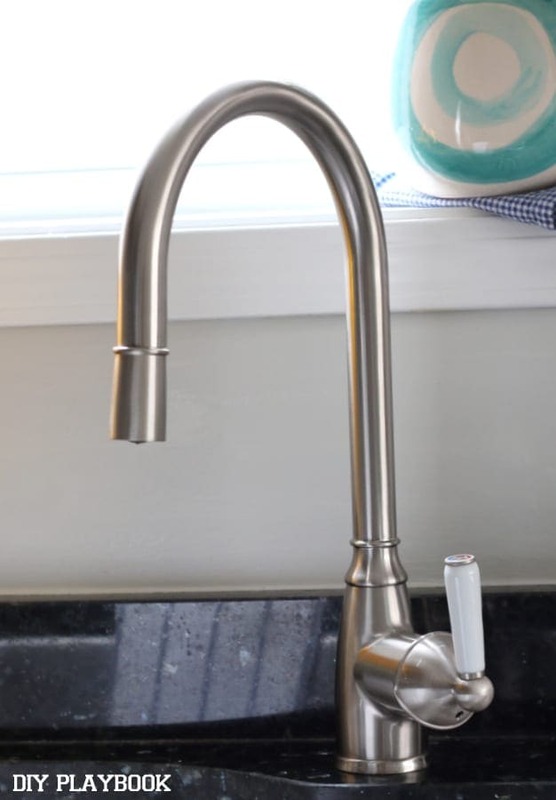 This is something we recently started doing, but it has been a game changer for our household. 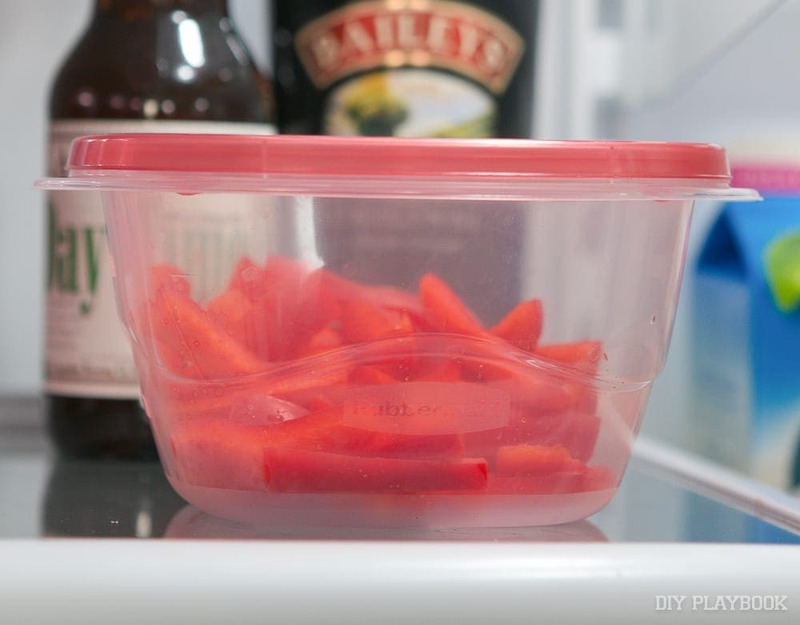 Whenever we do cut up veggies or do Sunday prep for the week, we always separate our prepared food into tupperware. Often times we would forget how long items were in the fridge, and we’d end up tossing them too early, or too late. Now, I take a piece of washi tape and a pen and I write the prepared date right on there. 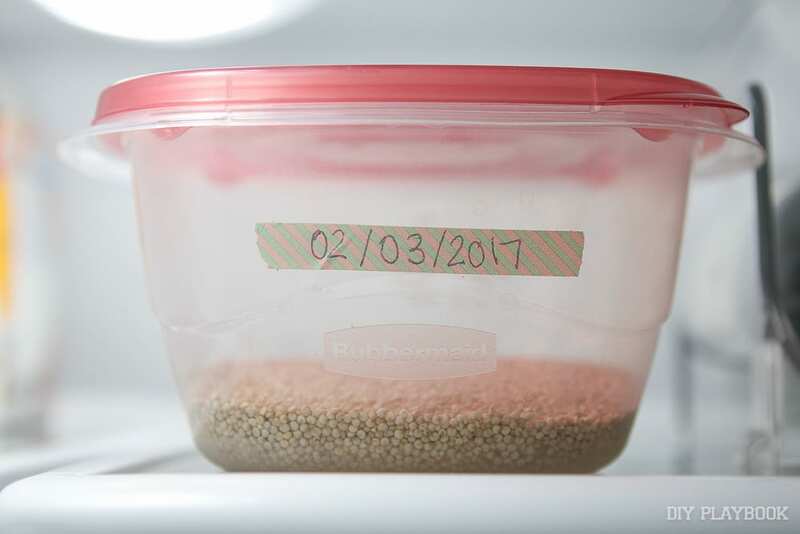 It takes 2 minutes and keeps everything much more organized in our refrigerator. So there you have it. 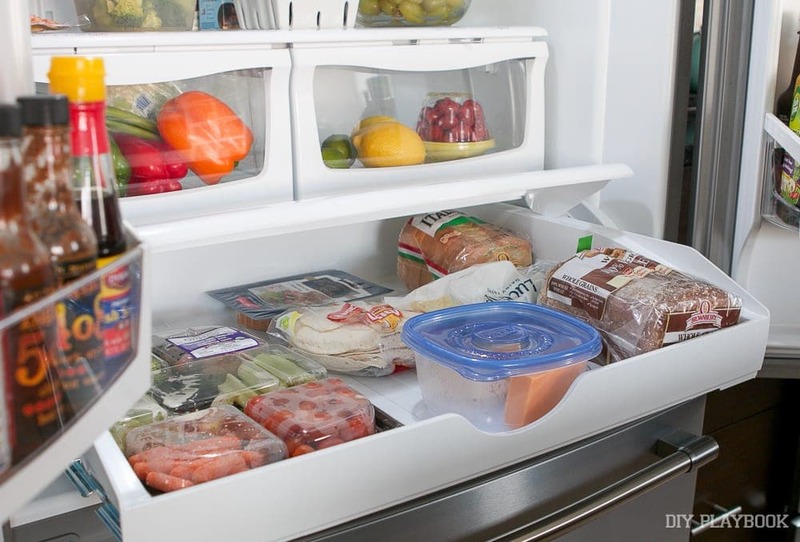 Some of the tips we practice on a regular basis to keep our fridge looking good and organized. And I must add that the outside of the fridge stays just as neat as the inside, thanks to the fingerprint resistant stainless steel. 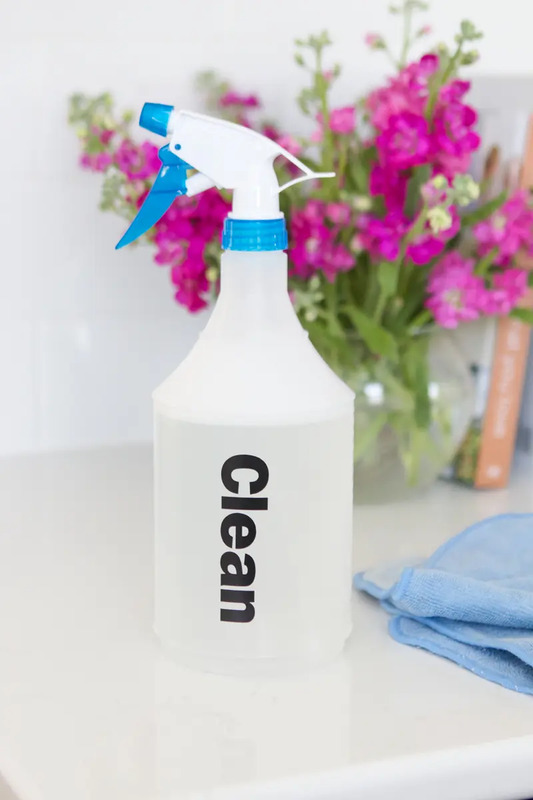 What a game changer for this household (no more wiping smudges away constantly!). 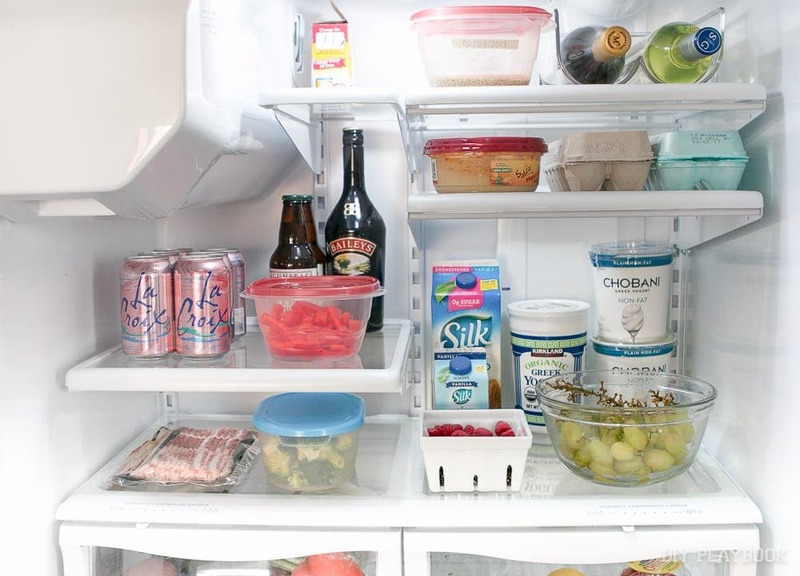 With these tips, I’m hopeful that you too can organize your fridge for good! And a special thanks to this guy, who always keeps the fridge in tip-top shape and me well fed.